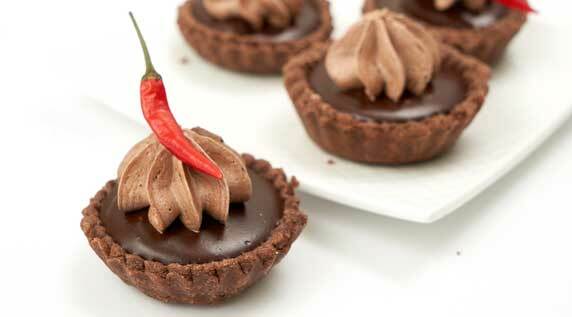 Lemongrass and chile peppers are infused into cream to create a herbaciously sweet and spicy tart. 1. In a bowl, combine flour, cocoa powder, sugar and salt. 2. Cut in butter until mixture becomes crumbly. 3. Add egg and vanilla. Keep mixing until the dough starts to clump together. 4. Place dough on a lightly floured surface and form into a ball. 5. Flatten ball slightly to form a thick disc. Wrap with plastic and refrigerate for at least 1 hour. 6. Remove from refrigerator and let sit on counter to soften. 7. On a lightly floured surface, roll dough out into desired size. 8. With a sharp knife, trim the edges to fit the tart pan. 9. Cover pan with plastic and freeze for 30 minutes until firm. 10. Press aluminium foil against the crust and evenly distribute pie weights/dried beans/uncooked rice inside the shell. 11. Bake crust at 350°F for 10-20 minutes until foil no longer sticks to dough. Transfer to wire rack and remove weights and foil. 12. Bake for additional 10 minutes, until shells appear dry. Transfer to wire rack and cool completely. 1. In a saucepan, bring cream, vanilla, chile and lemongrass to a boil. 2. Remove from heat and let steep for 5 minutes. 3. Melt chocolate in the microwave or in a double boiler. 4. Remove lemongrass and chile from cream mixture. Bring back to a boil. Pour half of mixture over beaten eggs to temper. Mix well. 5. Place mixture back into the pot. Add the melted chocolate and stir until sauce coats the back of the spoon. If the filling starts to curdle use a hand blender to mix until smooth. 1. When the chocolate shells have cooled, pour in the ganache. Let cool. 2. Tart can be garnished with ice cream or whipping cream.